I need to explain this sky chart first. A panoramic view was required, rather than my usual flat-horizon chart. That is why the horizon appears curved, as it would with a wide-angle camera lens. In fact, so much needs to be shown that I’ve linked it to a larger version of the same image. Click on the chart to enlarge it in a new tab. You’ll see that the azimuth (compass heading) extends from 100° (near-East) to 260° (near-West). Not like you’re really going to need a chart to find the “Brightest Trio.” They’ll be the brightest three objects in the sky (unless the Moon is up). But having this chart will allow you to identify some of the other stars and constellations visible. Jupiter: azimuth 100°, elevation 44°, currently at a distance of 4.6 AU. Sirius (aka α Canis Majoris): azimuth 160°, elevation 38°, at a distance of 8.611 LY. Venus: azimuth 260°, elevation 32°, currently at a distance of 1.3 AU. Here’s a quick explanation of those distance units. 1 AU (astronomical unit) is the radius of Earth’s orbit around the Sun. It’s equal to about 150 million km or 93 million miles. 1 LY (light year) is the distance light travels in one year — about 9.5 trillion km or 6 trillion miles. Sirius is much farther away than Jupiter or Venus, but it’s relatively close compared to most other stars. And Sirius is a blue giant star, 1.75 times the size of the Sun, and 26 times more luminous. So Jupiter, at present, is 330% brighter than when it’s farthest from Earth. For Venus, that number is 292%. The brightness of most stars varies only slightly, by an amount invisible to the unaided eye. Our own Sun varies in brightness by about ±0.1% over an 11-year cycle. A small number of stars, known not surprisingly as variable stars, do show visible changes in brightness. But they represent only 1-2% of all the stars you can see. If you’re curious about that lighter blue streak running vertically through the chart, that’s the Milky Way. You won’t see it unless you have dark skies, minimal light pollution, and no Moon. But Jupiter, Sirius, and Venus are bright enough to be seen even from urban locations. So get outside and take a look at this bright trio over the next few weeks, while all three are still visible. You don’t need to know much astronomy to identify them, and you don’t need a telescope. 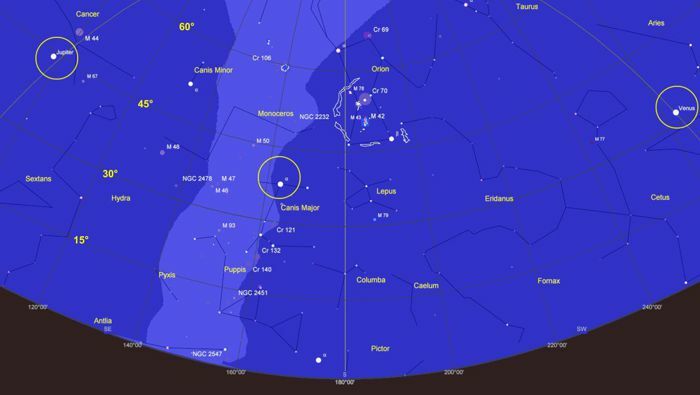 Just look for the brightest objects in the general locations indicated on the chart — you can’t miss them. I bid you clear skies.